It seems like only a couple of months ago that I was wondering if the snow was ever going to end. Oh wait, it was only a couple of months ago. In line with these crazy "new" weather patterns, it has been sizzling hot and uncomfortably humid around here for the past couple of weeks. We've been on the move a lot this summer, too, so the need to stay hydrated is first and foremost. Whether you're packing a small picnic lunch to eat while you're out and about, or planning an all-out, honest to goodness relaxing picnic - don't forget the ice cold beverages! Regardless of how it may seem, I do pack things in my picnic basket that don't have alcohol in them. Of course, there's never a bottle or flask too far away. Colorful and fruity agua frescas are always a hit. Energizing chia seed laden drinks are also a favorite. We almost always have a jug of cold, refreshing ice water. But, don't forget the iced tea! 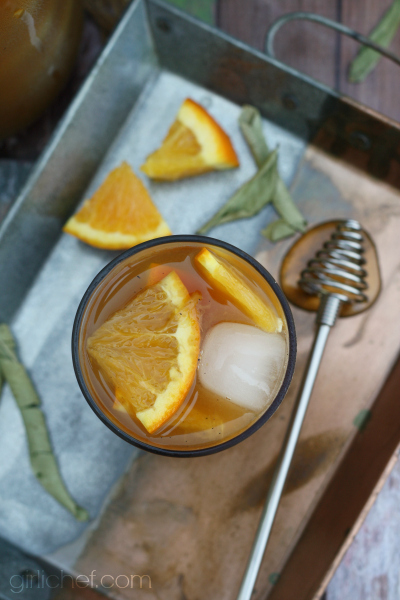 Whether you brew it lazily in the sun like my parents always did when I was growing up, or make quick work of it on the stovetop, it makes for a very versatile, very refreshing cool-me-down. For this version, I used Black & Green tea bags. Go ahead and use your favorite type of tea. Or go half and half! Since I wanted something a little different, I brewed it with orange leaves and a vanilla bean, then stirred some freshly squeezed orange juice and added the delicate, floral essence of orange blossom water, and orange blossom honey to sweeten. I'd call it refreshing and relaxing all at once. Pour it all into a couple of big thermoses or lidded jars, slide them into the picnic basket, and you've got the perfect picnic drink. 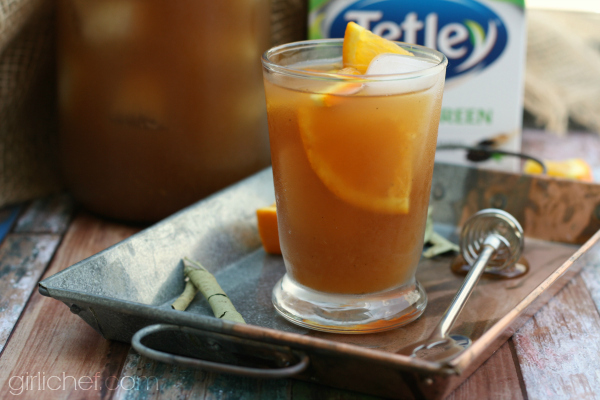 This Black & Green Iced Tea is lightly sweetened with delicate notes of floral and orange. Place water, orange leaves, and vanilla bean pod and seeds into a medium-large pot and bring to a boil. Add the tea bags, stir, and then turn off the heat. Allow to sit for 5 minutes, then remove the tea bags, squeezing liquid back into the pot; you should have 6 cups of tea. Strain into a pitcher to remove the orange leaves vanilla bean pods. When juicing the oranges, I recommend doing it over a medium-mesh strainer (or you could strain it after you squeeze it) to remove the pulp, which leaves a cloudy residue in the tea. But if that doesn't bother you, then don't worry about straining it. 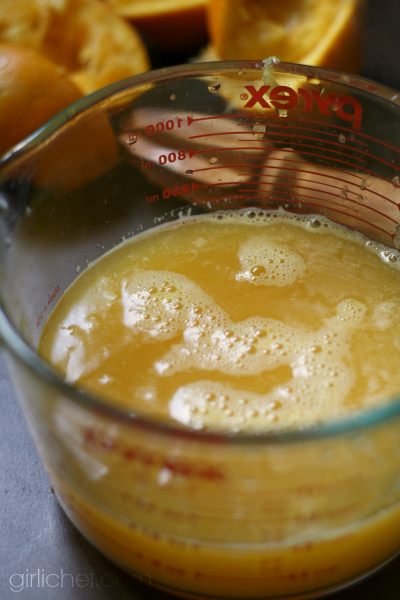 Stir in the orange juice, orange blossom honey, and orange blossom water. Refrigerate until cold. 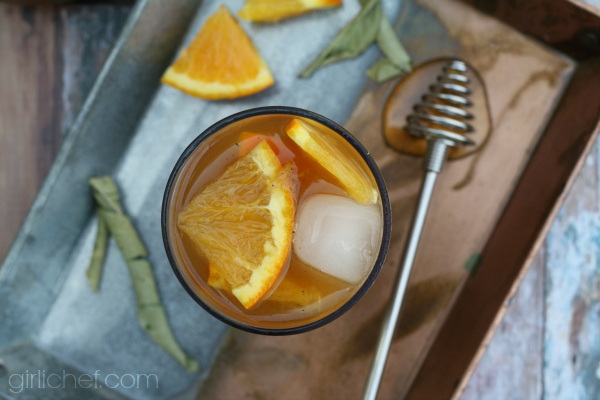 Add ice and a couple of orange slices to your glass, then pour the tea to fill. Enjoy cold!